In light of climate change, failures in industrial agriculture, increased energy costs and demographic pressure, and as multinational corporations increase their control of the food system, a significant rise in food prices, if not food shortages can be expected. This situation is compounded by the fact that by 2030, 60% of the world’s population will live in cities, including 56% of the world’s poor and 20% of the undernourished. Today, for a city with 10 million people or more, over 6,000 tonnes of food has to be imported every day, traveling an average of 1,000 miles. Given these scenarios, urban agriculture (UA) is becoming a major sustainable alternative for food security on an urbanised planet. Urban production of fresh fruits, vegetables, and some animal products, near consumers, improves local food security, especially in underserved communities. By improving access to fresh, nutritious food, UA can help in combating childhood obesity, diabetes, and poor nutrition that are prevalent in many urban communities. In response to food insecurity, UA has spread rapidly. From 1950-2005 UA increased in developing countries by 3.6% annually. In the United States, UA has expanded by >30% in the past 30 years. One reason for this is the fact that UA can be very productive, providing an estimated 15–20% of global food. However, an important question remains, what level of food self-sufficiency can cities obtain through UA? A survey with the goal of providing 300g /day per capita of fresh vegetables, found that 51 countries have insufficient urban area to meet the recommended nutritional target. In addition, UA would require 30% of the total urban area to meet the global demand for vegetables. More optimistic estimates have calculated that, for example, Cleveland, Ohio, with its population of 400,000, has the potential to meet 100% of urban dwellers’ fresh vegetable needs, 50% of poultry and eggs, and 100% of consumed honey. These estimates suggest that self-sufficiency could be achieved, depending on how UA is designed and managed (i.e. crop arrangements, production practices used, size of plots). Urban farmers do not always optimise crop planting density or diversity, thus modifications of cultural practices to enhance yields are necessary. Agroecology can help realise the productive potential of UA by providing key principles for the design of diversified, productive, and resilient urban farms. Agroecology uses well-established ecological principles for the design and management of diversified urban farms where external inputs are replaced by natural processes such as increasing soil fertility and enhancing biological pest control. Agroecological principles (Table 1) are applied by way of various practices. These lead to optimal recycling of nutrients and organic matter turnover, closed energy flows, water and soil conservation and balanced populations of pests to their natural enemies, all key processes in maintaining UA productivity. The integrity of an urban farm relies on synergies between plant diversity and a soil rich in organic matter and soil biota. Soils with high organic matter and active soil biological activity exhibit good soil fertility and beneficial organisms that prevent pathogen infection and pest incidence. Integration of soil, water, and pest management practices constitute a robust pathway for optimising soil quality, plant health, and crop production. A key agroecological principle is the diversification of urban farms, which combines crops in temporal (rotations) and spatial arrangements (intercropping); at times combined with fruit trees and small animals. Intercropping involves mixtures of annual crops in the same plot of land at the same time, resulting in increased crop diversity which improves soil organic matter (SOM), soil cover, water retention capacity and microclimatic conditions favouring production. Crop diversity also enhances resilience to climatic variability and favours arthropods and microorganisms involved in improved nutrient cycling, soil fertility, and pest regulation. Synergistic crop combinations include tall and short plants, plants that use resources at different times, shallow- and deep-rooted plants that exploit different soil horizons such as legumes with cereals, tomatoes and basil or beans, lettuce or mescluns between rows of leek or garlic, arugula under kale. Good crop mixtures lead to increased productivity partly due to the process of facilitation, when one crop modifies the environment in a way that benefits a second crop, for example, by lowering the population of a pest, or by releasing nutrients that can be taken up by the second crop. A combination of two contrasting species leads to greater overall productivity because the mixture can use resources (nutrients, water, sunlight) more efficiently than separate monocultures. The overyielding of intercrops is measured using the Land Equivalent Ratio. When the value is higher than 1, polycultures overyield (i.e. a LER of 1.5 it means that a monoculture requires 50% more land to obtain the same yield of the polyculture). In our experiments at Berkeley, we have obtained LER values > 1.3 in combinations of lettuce and mizuna, tomatoes and beans, broccoli and fava beans, and kale and arugula. Crop rotation is the practice of growing a sequence of different groups of crop species (legumes, root crops, fruit crops, and leaf crops) in the same area for many seasons. By dividing the garden in 4 plots (each planted to each group of crops), every successive year each group moves to the next plot clockwise. Basic rules include alternating between legumes and non-legumes, never planting crops of the same family consecutively, and alternating crops of deep and shallow roots. Legumes increase available nitrogen in the soil, even after they are harvested, for future crops. Including legumes in crop rotations reduces the need for external nitrogen inputs. Rotating plant families reduces soil-borne diseases like verticillium wilt and soil-dwelling insects. Agroecology promotes a series of soil-health-improving management practices such as complex crop rotations, intercropping, minimum tillage, cover cropping and use of a variety of organic amendments. These management practices, increase inputs of SOM, decrease losses of carbon, maintain soil coverage, decrease soil disturbance and encourage beneficial organisms. Improved soil properties resulting from such practices have added benefits such as more available water, less compaction, enhanced nutrient availability, and the production of growth-promoting substances, which promote growth of healthy and productive plants. Most crops grown on compost-amended soils have positive yield response. In our studies, we have found that average yield (weight/plant) of tomatoes amended with one application of 12 t/ha (4.8 tonnes/acre) compost was 23 and 38% greater than plots amended with 6 t/ha (2.5 tonnes/ acre) and un-amended controls. Moreover, organic soils exhibit high populations of antagonists that suppress many soil-borne diseases. A main challenge for urban farmers is to access animal manure as a source of Nitrogen as shortage of available N may greatly reduce crop yields. Many cities do not allow animal-raising, which further limits N availability. As an alternative, many farmers grow green manures such as fava beans, vetch and peas, or a mixture (at times adding 20% rye or barley) in fall and winter. This constitutes an important strategy to increase N supply for crops. In California a vigorous green manure growing for four to six months before incorporation typically adds between 112 and 224 kg N/ha (100 and 200 lb/acre) N to the soil for the succeeding crop. Yields of most vegetable crops increase with increasing rates of N. Carbon to N ratio of incorporated materials should be equal to or less than 20:1 to assure net short-term mineralisation and avoid N “hunger”. Many urban soils have been impacted by uses that may leave a legacy of contamination. Surveys in US cities have found soil lead concentrations above 400 mg/kg in many urban gardens. On-farm generated organic amendments like animal manure, compost and green manures have some utility for low-level remediation due to dilution and stabilisation of potential contaminants. There are natural enemies of pests on urban farms and they constitute a form of biocontrol by regulating pest populations. These enemies include predators, parasitoids, and pathogens. Their effectiveness is typically constrained by low floral resource availability in and around urban farms, due to the higher percentage of impervious surfaces in the urban landscape. Our research shows that it helps to sow borders or strips of buckwheat, sweet alyssum, coriander, wild carrot, phacelia and fennel early in the season. The abundance of syrphid flies, lady bugs and many parasitic wasps increases as the strips provide them with pollen and nectar. The literature suggests that diversification in urban farms achieves positive outcomes, including natural enemy enhancement, reduction of pest abundance, and reduction of crop damage. Many studies conducted on cabbage, broccoli and brussel sprouts have reported three results: aphids and flea beetles are more likely to locate and remain on host plants occurring in monocultures than in cole crops associated with other plant species; pests immigrate into polyculture systems at significantly lower rates than into monoculture systems; and, pests emigrate from polycultures at significantly higher rates than from monocultures. Moreover, generalist natural enemies tend to be more abundant because they can utilise a greater variety of hosts available in diverse garden systems, and their action usually results in lower herbivore population densities. Mixed crop systems can also decrease pathogen incidence by slowing down the rate of disease development and by modifying environmental conditions so that they are less favourable to the spread of certain pathogens. Moreover, many intercrops are often superior to monocrops in weed suppression, as intercrop combinations can exploit more resources than sole crops. This suppresses the growth of weeds more effectively through greater pre-emptive use of resources. Farmers need water to irrigate their crops and provide drinking water to their animals or fish. In the event of water shortages or decreasing quality of the available water sources, urban producers can access sources such as wastewater, greywater, or harvested rainwater, and apply such water via irrigation more efficiently than can rural producers. In areas of water scarcity, productivity should be measured per unit of water (weight or volume), with the goal of irrigation systems reaching efficiency values > 60%. In rainfed regions improvements of rainwater capture, selection of drought tolerant varieties, alternative tillage systems, and mulching are critical to secure good harvests. Addition of organic amendments to the soil is vital as many studies show that SOM enhances water retention. Depending on the soil type, it is estimated that for every 1% increase in SOM, the soil stores 1.5l of water per square meter. Organically rich soils usually contain arbuscular mycorrhizal (VAM) fungi, which are of particular significance under water stress conditions, as VAM colonisation increases water use efficiency. Examples from productive urban farms around the world suggest that self-sufficiency in terms of vegetables could potentially be achieved at the level of a community or city. Well-designed urban farms can be up to 15 times more productive than rural holdings. In Cuba, an area of just one square meter can provide 20kg of food a year (200 tomatoes (30kg) per year, 36 heads of lettuce every 60 days, 10 cabbages every 90 days and 100 onions every 120 days). But this requires the application of agroecological principles to guide the intensive cultivation of a diversity of vegetables, roots and tubers, and herbs in relatively small spaces. It also requires that citizens have access to sources of green biomass and/or manure as nutrient sources. Some cities provide weekly residential collection for plant debris and food scraps. In 2010, the city of Berkeley, California collected 13,650 tonnes of residential food and green waste and 6,500 tonnes of food scraps from commercial customers. This material is processed by a private composting company, which at the end of each month from February to October makes freely available 80-120 cubic yards of compost to residents. Agroecological designs feature well-planned crop diversity, complemented by organic soil management. 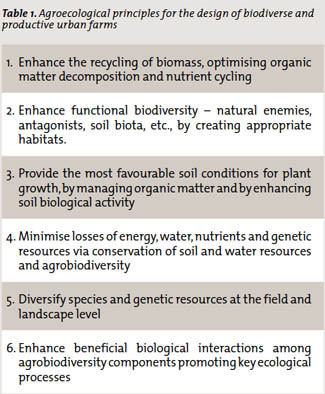 Together these comprise an effective agroecological strategy to improve nutrient cycling and soil fertility. They also limit nutrient and water losses, reduce impacts of pests, diseases and weeds and enhance overall productivity and resilience of the cropping system. But diversifying urban farms per se does not necessarily mean that they are being managed agroecologically, unless the collection of crops chosen interact biologically. Many urban farms are diversified in response to food security or market demands. Such farms do not reach full potential as the crops do not interact with each other synergistically, necessitating external conventional or organic inputs of fertilisers or pesticides. The key is for researchers and practitioners to find the right combinations of crops that complement each other to achieve overyielding.